Dr. Nader Chalfoun, Ph.D., LEED AP©, CEA, is a Distinguished Professor of Architecture and Environmental Sciences at the College of Architecture, Planning, and Landscape Architecture of the University of Arizona. He is the chair of the Master's of Science in Architecture program that focuses on “Design and Energy Conservation” and he is regionally and internationally recognized for his work on building energy efficiency and energy performance modeling. He is a LEED© Accredited professional active in the U.S. Green Building Council. 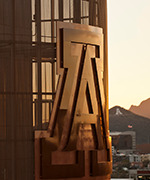 As the founder of the University of Arizona’s “House Energy Doctor” program, His research and teaching includes courses, seminars and design studios that focus on the environment and sustainable green building design including building technologies, energy conservation, passive solar architecture, and Net-Zero design. Dr. Chalfoun holds the “Legend in Energy” title. He published widely and designed environmentally focused projects around the world and served on various local and international committees, has one patent, several teaching and research awards and two professional registrations. Appropriate Energy Design Guidelines for New Desert Housing in Egypt: "A Case Study for Cluster Houses at Sadat City". Chalfoun, N. V. (2018). "A Solar Farm Prototype Design that Achieves Net-Zero Status and Economic Development at the Organ Pipe Cactus National Monument in Arizona, USA.”. International Journal of Environmental Impacts , 12. Going, S. B., Zuniga Teran, A. A., Orr, B. J., Guertin, D. P., Marsh, S. E., Gimblett, H. R., Chalfoun, N. V., Chalfoun, N. V., Gimblett, H. R., Marsh, S. E., Orr, B. J., Guertin, D. P., Zuniga Teran, A. A., Going, S. B., Going, S. B., Guertin, D. P., Marsh, S. E., Chalfoun, N. V., Gimblett, H. R., , Orr, B. J., et al. (2017). Designing healthy communities: Testing the walkability model. . Designing healthy communities: Testing the walkability model , 6(1), 63-73. Chalfoun, N. V. (2018, December). Sustainability in Architecture Curriculum Dissemination through Virtual Exchange: the case of University of Arizona’s House Energy Doctor and the American University of Cairo”, USA-Egypt . The 10th Franco-American Conference on CyberSecurity. Radisson Suites Hotel, Tucson Arizona: Partner University Fund (PUF), UA NSF Center for Cloud and Autonomic Computing, and NSF Cybersecurity Scholarship for Service (SFS)..
Moeller, C. B., Gaxiola Camacho, I. E., & Chalfoun, N. V. (2018, October). Architectural Implementation of Vegetated Cover From Agriculture for Restoring Human Thermal Comfort and Mitigating The Urban Heat Island Effect In Arid Regions . Urban Agriculture 2018, 1st International Conference on Urban Agriculture and City Sustainability,. New Forest, UK: Wessex Institute, UK + Polytechnic University of Valencia, Spain. The first International Conference on Urban Agriculture and City Sustainability took place in the New Forest, UK. The Conference was organised by Wessex Institute, UK represented by Dr Stavros Syngellakis and the Polytechnic University of Valencia, Spain represented by Professor Jose Luis Miralles i Garcia.The aim of the Conference was to review and discuss ways in which urban agriculture can contribute to achieving sustainable cities. As urban populations continue to increase, it is essential to consider ways of reducing their impact in terms of the use of natural resources, waste production and climate change.